The British supremo, General Haig, thought he could take advantage of the troubles experienced by the French to try once again to achieve a decisive breakthrough of the German lines. This time he planned an offensive in the vicinity of Ypres, in the infamous Flanders’ Fields. Battles had already been fought there in the fall of 1914 and the spring of 1915, so Haig’s initiative was to go down in history as the Third Battle of Ypres. It was to be an extremely violent affair. Haig’s new “big push” was prepared very thoroughly. Things got going with a kind of prelude on June 7. The British, who had dug tunnels under the German lines, blew up the enemy positions to the south of Ypres with mines. The explosion was so loud that it could be heard on the other side of the English Channel. The British infantry attacks that followed succeeded in pushing back the German lines by about seven kilometres in the course of a week, which reduced the enemy pressure on Ypres. This so-called Battle of the Mines at Messines (or second Battle of Messines) was also a success in the sense that, for the very first time, there were more men killed on the side of the defending Germans than the attacking Tommies, namely 25,000 versus 17,000. In any event, the result was yet another plentiful harvest for the Grim Reaper. The craters carved into the Flemish soil by the explosion of the mines were to fill gradually with water, thus creating ponds like the one in the village of Wijtschate, known today as the Pool of Peace. On July 31, the Third Battle of Ypres started officially with a large-scale British attack on German positions to the east and north of the city. Once again, the German defence proved to be particularly resolute. Two factors played an important role. First, in front of their own first lines, on carefully chosen strategic spots within the no man’s land, the Germans had constructed small concrete bunkers – nicknamed pillboxes by the British – whence they could mow down attackers with their machine guns even before they reached the first German trenches. Second, the Germans relied increasingly on a new kind of soldier, handpicked, highly motivated, thoroughly trained, and armed to the teeth, especially with machine guns and grenades. These “storm troops” (Sturm- orStoßtruppen) had first made an appearance at the front towards the end of 1915. (And the Russians had used a similar type of soldier during the Brusilov Offensive of 1916.) Their specialty was the infiltration of enemy trenches, and it is in this capacity that they would be used massively during the great German offensive in the spring of 1918. But they also performed very well defensively, and it was these storm troopers, ensconced in pillboxes, that would inflict heavy losses on the attacking British and Canadians in the Third Battle of Ypres, for example in the vicinity of the village of Passchendaele, whose surroundings had been transformed by endless rain into a sea of stinking mud. It is not a coincidence that the Tyne Cot Cemetery, the largest British war cemetery in the world, situated at a stone’s throw from that village, was constructed on the remains of three German pillboxes. With respect to the storm troopers, it should be noted that they were to serve as model for the brown-shirted militia of Hitler’s Nazi party. After particularly nasty fighting, the Third Battle of Ypres concluded in November 1917 with the capture of Passchendaele by the Canadians, of whom no less than 17,000 were killed or wounded in the course of that action. 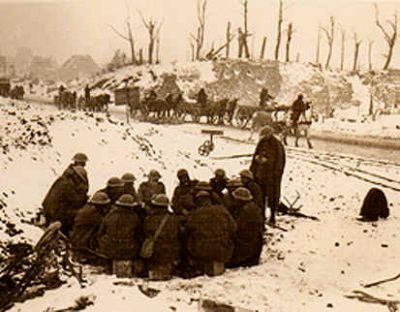 A British general who subsequently came to inspect that sector of the front could not believe his eyes when he saw how the men had had to advance through the mud and past numerous pillboxes before they had been able to conquer the German positions on the high ground of Passchendaele village. The British generals had most certainly given such an order, and it had cost the British and Imperial forces a quarter of a million of men killed or wounded. The German lines had been pushed back, but the breakthrough of which Haig had dreamed had never even come close to materializing. That did not prevent Haig from proclaiming loudly that the Third Battle of Ypres had produced a most splendid British triumph. During the month preceding the start of his offensive in Flanders’ Fields, Haig had received orders from above to “dismount” the cavalry and to transfer its men to the infantry. It was the intention to ship the horses via Egypt to the front in Palestine. Over there, in contrast to the western front, the cavalry continued to be useful in the mobile war against the Ottomans. Haig protested and opposed this decision because the cavalry was his favourite weapon, and in spite of the experiences of the Battle of the Somme, he planned to involve the men on horseback in his new offensive, albeit with less ambitious objectives than in the previous year. He was allowed to keep enough cavalry to keep on dreaming of a heroic, and possibly decisive, role for it, and opined that the cavalrymen might be able to take advantage of opportunities created by the infantry, perhaps in cooperation with tanks. Nothing was to come of this, but Haig continued to fantasize about glory for his horsemen until October, when heavy autumn rains soaked the battlefield and made any use of the cavalry chimerical. In the Austro-Hungarian army, most units of the aristocratic cavalry had already been dissolved in the spring of 1917 on account of their uselessness. A Hungarian officer sadly noted that “the cavalry, the pride of [the] army, the jewel in its military crown, the men with the finest uniforms, is to be wound up,” and he concluded that “one more piece of the old Europe is disappearing.” The cavalrymen only continued to be used for escorting prisoners of war, for patrols behind the lines, and, of course, for parades. But he acknowledged that it had not been possible to use the mounted troops effectively in this modern war, and that all too often great numbers of men and horses had been mowed down by machine guns. Another problem was that the horses ate too much. it was not such mundane economic considerations but “the aesthete and the snobbish side of him” that made this officer bemoan the demise of the cavalry. In the spring of 1918, the majority of the cavalrymen of the French army would likewise have to dismount. They did so all the more reluctantly because they now had to join the humble footsoldiers in the trenches. The latter did not hide their Schadenfreude, because for years they had resented the fact that the gentlemen of the cavalry had been able to lead a comparatively safe and leisurely life behind the lines, waiting for the day when they would be able to gallop through a gap in the German defences. It was in this inglorious fashion that everywhere in Europe – with the exception of the Balkans and a few sectors of the eastern front – the role of the cavalrymen in the Great War was terminated in 1917. The opening stages of the conflict, in August 1914, are still associated with images of the cavalry, more specifically paintings of German uhlans and French cuirassiers, sporting fur hats or shiny helmets and armed with sabre or lance, appearing proudly on the scene as vanguards of armies on the march. On the photos taken on the battlefields in 1918, however, the men on horseback are absent and we see infantrymen being transported to the front in trucks or advancing in the no man’s land behind tanks, with airplanes circling overhead. And yet the upper classes, especially the nobility, had hoped that their favourite weapon would distinguish itself in this war. Featured image is from History Learning Site.